Start with the paper. It must be clean and of the best quality. Make sure to print the term paper content on one side. The other issue that you must keep in mind is the margins. At the page top, right and left, bottom sides it is required to leave the term paper margins 2.5 cm. There is an exception for the page numbers that are put 1.25 cm from the page upper-right hand corner at the top that is flushed exactly to the right margin. Now it’s time to get to the title page of the project. If there is no title page yet, start with 2.5cm from the top of the very first page and type your name flushed to the left margin. Next type the name of your teacher right after your name. Make certain to type it double-spaced and adjust to the left margin. Make sure to place the code of your course, as well as the date there. If the tutor does not want you to number the first page, start numbering with the page 2. After the date make certain to double-space and put the term paper title on the new line, in the center. It is important to number your pages throughout the paper in the upper right hand corner, flush with the margin from the right side. Remember to write all numbers in Arabic numerals. It is forbidden to add anything in order to decorate the number of the page. No parenthesis, underlines or asterisks should be placed. Besides, after the number of the page there should be no period. Spacing between the lines is what the author of the term paper must take into account. 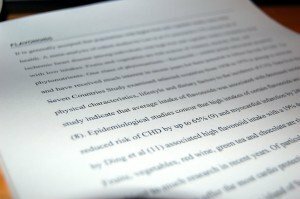 Whether your project is printed or typed, the whole paper should be double-spaced between the lines. And do not forget to include the 1″ margin on every side so that your tutor could provide relevant comments. Table of contents is an integral part of the term paper. This section can be pretty helpful since it shows the page number where each term paper section begins. When working on the term paper for the university or college discipline, make certain to place the following items into it: the Acknowledgements, the Foreword, the Introduction section, the Body segment, the Summing Up or Conclusive Section, the Afterword, the Explanatory Notes, the Appendices, the Glossary, the Endnotes part (in case you are not using Parenthetical citations or Footnotes), the Bibliography section, Index. If you wish to make the term paper Table of Contents less involved, make sure to provide the following sections only: the Intro, the Body section, the Summarization part or Conclusion), References (or Works Cited), as well as the appropriate page number where every section starts. Additionally you can buy a custom term paper online from our paper writing service. We can provide you with a properly formatted term paper written from scratch.